PERT-WEEK - Doctor Who: Looking Back At FRONTIER IN SPACE | Warped Factor - Words in the Key of Geek. Is either school right? Well yes, technically both are. The Draconians certainly are a fantastic mask and make-up job, and when you see Roger Delgado’s Master in a different context to his usual Earth-based environment, there’s a thrill that makes you realise the potential of the character, an ‘OMG he really is a Time Lord!’ moment that makes you do whatever the 1970s, less acceptable equivalent of squeezing is. And yes, with a tighter edit, you could turn Frontier In Space into a very solid, pulse-thumping four-parter. But I would argue if you did that, all you’d end up with Is a pulse-thumping four-parter, whereas the reasons we all really remember Frontier In Space – the reasons we still put it in our DVD players so many years after it was broadcast – are actually what fills the additional space. It’s one of those rare cases in Doctor Who, where you know there’s filler, but the filler’s so good, you don’t dare to touch it. Yes, there’s a lot of toing and froing in Frontier In Space, but all that toing and froing actually develops the layers and the texture of the world in which the story is set – we get to see the attacks on shipping first hand, and know almost from the outset that there’s a third party playing both sides against each other. The subsequent passing back and forth between the Earth government and the Draconian embassy functions act both as filler and as extra butter, adding to the richness and gloss of the situation. The point being that without this deeper understanding, the plot is pretty paper thin, and we discover it early on: two great powers, at an uneasy peace for years after a previous war, and someone else stirring up tension – that’s it. The only way Frontier In Space works is to give us that texture, to let us feel the entrenched mindsets, the strained relationships, the arguments on which the fate, and the ‘soul’ of humanity rests. It’s basically a replaying of the Cuban Missile Crisis, only in space – and the only way you make that exciting is to go beyond the rhetoric of giant space fleets poised to kill each other, and take us into the tense, sweaty, real world of the players. Do we need the penal colony on the Moon and the Master involved? Well, the penal colony shows us that this is not a simple conflict, as perhaps it would have been in the Hartnell or Troughton eras: we can’t simply side with the people who look more like us, because they’re not perfect either – they’re locking up peaceful dissidents, and throwing away the key, and even the reasonable figure of Earth’s president consigns the Doctor to this fate without a trial when he becomes just one problem too many on her plate – a moment of weakness for which it would be easy, albeit likewise too simplistic, to condemn her. 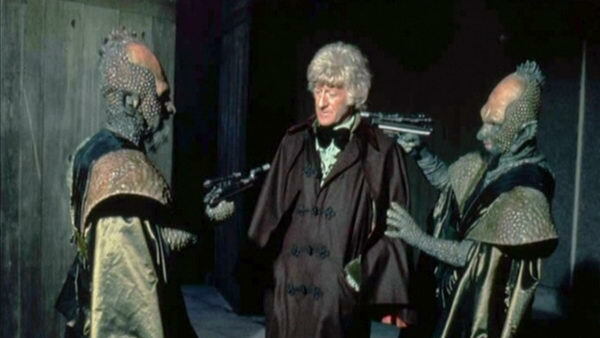 When people remember the Draconians so fondly, as Jon Pertwee did, citing them as his favourite alien, it’s not because of the great make-up and mask-work – at least, not wholly. We remember them for their complex backstory, their elegant though equally flawed government, and particularly, for looking like they should be monsters, but actually being the equals of the human protagonists in terms of complexity, subtlety and suspicion. It might be a little bit of a stretch, but you could make a case for the Draconians being the best example of ‘monsters’ not being monstrous in Doctor Who. Perhaps the best candidate to defeat their claim would be the Silurians – another complex species created by the same writer, Malcolm Hulke. Hulke was never afraid of putting his own left wing politics into his writing, and in both the Silurians and the Draconians he pushed the agenda of looking beyond the obvious differences between races to find the nobility beneath, and warned us as humans (and Western humans particularly) to check our superiority complex at the door if we wanted to make good diplomatic decisions. Stories would rarely if ever take the easy path in Hulke’s hands, and they certainly don’t in Frontier In Space. Given the time to do so, he shows us the complexity of General Williams’ history, both with Draconia and with the President. He makes us invest in the Draconians as a sympathetic equal power, and indelibly burn them into our curious minds forever – leaving their lesson of not judging by appearances or even necessarily by cultural differences instilled in us in the process. It’s only really in the resolution of why the two great species are on the brink of war that the wheels start to come off Hulke’s plot, as he’s built the layers of the scenario up and up, and towards the end, the weight of Ogrons, the Master and the Daleks proves a little too much for credulity, especially given that the Daleks turn up, shoot some humans and then fly off again, leaving them, and Delgado’s final scenes, feeling like a relatively lightweight ending to a story that has been complex, twisted, deep and realistic for most of its run time. Frontier In Space is not a story to slip into your DVD player if you’re going to be doing much else along the way. Certainly you can watch it that way: it’s not Tolstoy, you won’t lose track as such, but what you will lose is the weight of pressure, personality and culture that actually makes it deliver above its class for most of the way along. That the ending seems rushed and a little senseless is unfortunate, as it does a disservice to the time Doctor Who did high-stakes political drama at its finest. In some ways, Frontier In Space and The Caves of Androzani have much in common, but while Androzani would later keep the focus tight and the consequences personal, Frontier In Space attempted to show the grand scale of international (or interstellar) politics, and the importance of calm and rationality in their conduct. It was a lesson the world had not long before learned for real, and it still had a visceral analogue in the real world as the Western and Eastern Blocs continued building up their nuclear arsenals, just waiting for a wrong word, a wrong move to provoke if not a space war, then at least a third and probably final world war. 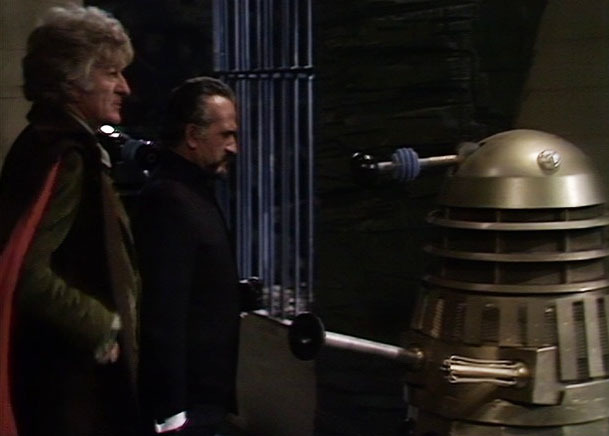 As the proliferation of nuclear weapons continued, Malcolm Hulke and Doctor Who showed us all how important it was to keep the itch in our trigger fingers at bay. 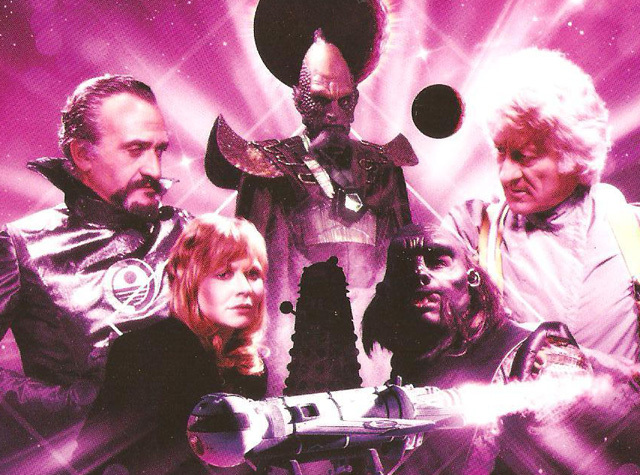 More than forty years on, and with the theatre of conflict shifted, the lesson of Frontier In Space is still worth learning.